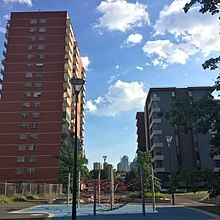 The Housing Commission of Victoria (colloquially known as the Housing Commission) was a Victorian State Government body responsible for public housing in Victoria, Australia. It was established in 1938, and was abolished in 1984. The main activity of the Commission was the construction tens of thousands of houses and flats in Melbourne and many country towns between the late 1940s and the early 70s, providing low rent housing for low income families. The most visible legacy of the Commission is the 47 or so high-rise apartment towers in inner Melbourne, all built using the same pre-cast concrete panel technology. The 'commission towers' are contentiously considered blights on the Melbourne cityscape, but successive governments have not been able to justify the expense of demolition, or have faced community opposition to demolition. Through the 1920s and early 1930s, a campaign highlighting the dreadful conditions and moral dangers of the 'slums' of inner city Melbourne was led by social reformer Oswald Barnett. Conditions in the run-down rented housing in the inner city areas deteriorated during the Great Depression, creating a 'housing crisis'. Barnett's campaigning against slums led to the establishment the Housing Investigation and Slum Abolition Board (HISAB) in July 1936. The HISAB's 1937 report found 3,000 houses 'unfit for habitation' and recommended the establishment of a Housing Commission. John O’Connor was the Commission's first chairman, while Oswald Barnett, Oswald Burt and Frances Pennington were appointed as part-time commissioners. The Housing Commission of Victoria was established under the Housing Act 1937 to improve existing housing conditions and to provide adequate housing for persons of limited means; the Slum Reclamation Act 1938 and the Reclamation and Housing (Financial) Act 1938 provided the framework for the Commission's work. On the passing of the legislation, the Victorian Premier, Albert Dunstan, declared the beginning of the Commission's activities as a 'war on slums', but also recognised the magnitude of the task before it. The legislation not only gave the Commission powers for housing construction and improvement, but also made it 'a planning authority in its own right'. The Commission's chief concerns however, were the 'slum pockets' which required 'excision' for the 'common good'. The Commission developed a plan of action in March 1938, concentrating its attention on 1,240 houses in lanes, rights-of-way and slum pockets, referred to in HISAB's earlier report. Slums were to be reclaimed and people rehoused. To house the people moved from the slum areas, the Commission needed to provide new homes. The Commission's first estate was an extension to the Garden City Estate in Port Melbourne, where pre-cast concrete technologies were employed for the first time. Next was the development of flats at Pigdon Street, Carlton, though the original proposal for three storey flats was reduced to two storeys after local opposition. The Commission then began to acquire cheap land in the northern suburbs of Coburg, Brunswick, Preston and Northcote as well as in inner suburban areas such as North Melbourne, Fitzroy and Richmond. The few estates built by the Commission before World War Two involved comprised modestly scaled suburban style housing, in simple brick construction, mostly as duplexes, such as the Racecourse Estate in Richmond, and the Railton Grove Precinct in Preston. The Commission's acquisition plans were ambitious and it was bound to come across difficulties. The synchronisation of the 'demolition program' was proving difficult and by June 1940, only 53 families had moved into new houses while only 99 houses had been ordered for demolition. The Commission also had difficulties dealing with local municipalities, in acquiring properties in the North Melbourne reclamation area as well as with the labour movement, who believed that the government should subsidise loans to enable workers to buy homes rather than rent them. The rehousing of those from the slums was a difficult task. As a landlord, the Commission also experienced problems. Tenants were initially reluctant to move, while rents on the estates were more expensive than in their former accommodation. At Fisherman's Bend, there was tension between tenants of the Commission's estate and those who had bought homes under an earlier housing program; vandalism was also a problem, both at Fisherman's Bend and in the West Brunswick estate. Frances Penington, who was also a social worker, advocated for community facilities to be built at the estates to alleviate some of these problems, these were built after protracted debate by others on the Commission. Transportation costs from the new estates to places of employment were also an issue. Despite these issues, residents 'adjusted to their new homes and locations' and appreciated the 'better home environment'. By 1942, building had halted as the Commission shifted its focus to post-war planning. It continued to acquire land though, taking advantage of low prices by purchasing land in industrial areas in the western suburbs as well as in the middle class eastern and southern suburbs. The Commission, in its planning authority capacity had also drawn up plans for the future development of Melbourne but by 1944, it was lacking resources to deal with backlogs of council plans. The Commission recruited Frank Heath from its advisory Architects Panel to deal with these problems but it was stripped of its town planning powers later in the same year. The Commission's 1944 report found that housing was required in 'large numbers as quickly as possible to house those recently returned to civilian life and catch up on the lag of construction over the war years'. The era of slum reclamation was over. While the Commission was planning for the future, so were its commissioners. Barnett and Burt published Housing the Australian Nation, reviewing the slum reclamation, but also putting forward their plans for a national housing policy. Barnett, Burt and Heath published We Must Go On calling for a fairer society and centralised planning. By now, housing for growing numbers was the main concern. After World War Two, with greater funding and a severe housing shortage, the Commission's activities greatly expanded through the late 1940s into the 1950s. The began to build larger and larger estates of housing in the suburban fringes, as well as country towns, of both single homes and duplexes, from stylish Old English style double brick to simple unadorned prefabricated weatherboard. The compulsory purchase and demolition of blocks of 'slums' in the inner and middle ring suburbs also gathered pace, usually replaced by apartment buildings of various designs, from long two storey blocks of prefabricated construction placed diagonally on the blocks in a garden setting to concentrated blocks of concrete and brick four storey walk-ups. The Commission was keen to produce the largest number of house at the lowest cost, and in an era when prefabrication was widely regarded as the most efficient construction method, the Commission continued its pre-war development of precast concrete houses. In 1946 the former Commonwealth Tank factory building in suburban Holmesglen was leased to the Victorian Housing Commission, and transformed into a 'Housing Factory' for the production of prefabricated concrete houses and flats. The entire operation became a production line process and by 1948, 1,000 houses had been produced. In the middle 1950s, the factory was producing two too four storey walk up flats, and by 1964 the Concrete House Project was turning out pre-cast walls for villas as well as walk-ups and would soon be producing the components for high rise towers. Approximately 27 of these precast concrete 20 to 30 storey height buildings were constructed around Melbourne, until the type of development fell into disrepute. By 1970 nearly 4000 privately owned dwellings had been compulsory acquired and replaced by nearly 7000 high rise flats. Production then moved to low rise walk up and single dwelling units, with about 10,000 homes using locally engineered design and erection methods constructed using the technology. Public housing was also built in regional Victorian cities, such as Wangaratta, Wodonga and Geelong. In the early 1970s with the towers out of favour, the Commission turned back to building large suburban estates, including the creation of satellite towns in Pakenham, Sunbury and Melton. The purchase of the land however was poorly handled, the Commission spending $11 million on land, some of which was not suitable for housing, and handing handsome profits to speculators. This 'land scandal' led to a Royal Commission in 1979 which found no evidence of corruption. The Commission became part of a new Ministry of Housing in 1973, and in 1984 the Commission structure was abolished in favour of an Office of Housing within the Ministry of Housing and subsequent similar Ministries. In 2018, Public housing is administered by the Housing, Infrastructure, Sport and Recreation division of the Department of Health & Human Services. Housing commission in Carlton, Victoria. There are 27 sites, spread across 19 suburbs in inner Melbourne that contain around 47 high rises in total. The largest sites contain four towers each as well as a numerous walk-up flats (many replaced in the 2010s); Elizabeth St, Richmond, Atherton Gardens, Fitzroy, Lygon Street Carlton and Racecourse Rd, Flemington. Other large sites contain three buildings; Boundary Rd, North Melbourne and Malvern Rd, South Yarra. The towers vary between 20–30 storeys in height and come in a variety of plan forms; S, T, Y, I, L and C-shape, the most common being the S-shape. The high-rises have become somewhat iconic, the instantly recognisable image of the Melbourne 'Housing Commission Tower Block' has been used in artworks, film and TV, and as a graphics on T shirts, bags and the like. ^ Howe, Renate (1988). Renate Howe (ed.). New houses for old : fifty years of public housing in Victoria, 1938–1988. Melbourne: Ministry of Housing and Construction. p. 20. ISBN 0-7241-4797-7. ^ "Housing Commission of Victoria". Encyclopedia of Melbourne. Retrieved 7 August 2018. ^ Russell, E.W. (1972). The slum abolition movement in Victoria, 1933–37. Melbourne: Hornet Publications. p. 8. ISBN 0-85919-191-5. ^ Howe, Renate (1988). Renate Howe (ed.). New houses for old : fifty years of public housing in Victoria, 1938–1988. Melbourne: Ministry of Housing and Construction. pp. 33–34. ISBN 0-7241-4797-7. ^ Howe, Renate (1988). Renate Howe (ed.). New houses for old : fifty years of public housing in Victoria, 1938–1988. Melbourne: Ministry of Housing and Construction. pp. 34–35. ISBN 0-7241-4797-7. ^ "Commission Meets". The Argus. 2 March 1938. Retrieved 7 May 2011. ^ Hutchings, Alan (1999). Stephen Hamnett & Robert Freestone (ed.). The Australian metropolis : a planning history. St Leonards, N.S.W. : Allen & Unwin. ISBN 1-86508-053-5. ^ Freestone, Robert (2010). Urban nation : Australia's planning heritage. Collingwood, Vic. : CSIRO Pub. in association with the Dept. of the Environment, Water, Heritage and the Arts, and the Australian Heritage Council. p. 217. ISBN 978-0-643-09698-1. ^ Howe, Renate (1988). Renate Howe (ed.). New houses for old : fifty years of public housing in Victoria, 1938–1988. Melbourne: Ministry of Housing and Construction. p. 37. ISBN 0-7241-4797-7. ^ "EXPERIMENTAL CONCRETE HOUSES". Victorian Heritage Database. Retrieved 7 August 2018. ^ Howe, Renate (1988). Renate Howe (ed.). New houses for old : fifty years of public housing in Victoria, 1938–1988. Melbourne: Ministry of Housing and Construction. p. 39. ISBN 0-7241-4797-7. ^ Howe, Renate (1988). Renate Howe (ed.). New houses for old : fifty years of public housing in Victoria, 1938–1988. Melbourne: Ministry of Housing and Construction. p. 40. ISBN 0-7241-4797-7. ^ "Racecourse Precinct". Victorian Heritage Database. Retrieved 7 August 2018. ^ "HCV Estate (Railton Grove) Precinct". Victorian Heritage Database. Retrieved 7 August 2018. ^ Howe, Renate (1988). Renate Howe (ed.). New houses for old : fifty years of public housing in Victoria, 1938–1988. Melbourne: Ministry of Housing and Construction. p. 41. ISBN 0-7241-4797-7. ^ Howe, Renate (1988). Renate Howe (ed.). New houses for old : fifty years of public housing in Victoria, 1938–1988. Melbourne: Ministry of Housing and Construction. pp. 43–44. ISBN 0-7241-4797-7. ^ a b Howe, Renate (1988). Renate Howe (ed.). New houses for old : fifty years of public housing in Victoria, 1938–1988. Melbourne: Ministry of Housing and Construction. p. 54. ISBN 0-7241-4797-7. ^ Howe, Renate (1988). Renate Howe (ed.). New houses for old : fifty years of public housing in Victoria, 1938–1988. Melbourne: Ministry of Housing and Construction. pp. 46–47. ISBN 0-7241-4797-7. ^ Howe, Renate (1988). Renate Howe (ed.). New houses for old : fifty years of public housing in Victoria, 1938–1988. Melbourne: Ministry of Housing and Construction. pp. 50–51. ISBN 0-7241-4797-7. ^ Barnett, F.O. ; Burt, W.O (1942). Housing the Australian nation. The Book Depot. p. 46. ^ Barnett, F.O. ; Burt, W.O (1942). Housing the Australian nation. The Book Depot. p. 22. ^ Howe, Renate (1988). Renate Howe (ed.). New houses for old : fifty years of public housing in Victoria, 1938–1988. Melbourne: Ministry of Housing and Construction. p. 55. ISBN 0-7241-4797-7. ^ a b Lewis, Miles (1999). Suburban backlash : the battle for the world's most liveable city. Hawthorn, Vic. : Bloomings Books. p. 46. ISBN 1-876473-16-9. ^ Housing Commission of Victoria (1963). Housing Commission, Victoria: The first 25 years. Housing Commission of Victoria. p. 3. ^ Barnett, F.O. ; Burt, W.O (1942). Housing the Australian nation. The Book Depot. ^ "HCV Newlands Estate". Victorian Heritage Databse. Retrieved 7 August 2018. ^ "HCV EAST RESERVOIR ESTATE". Victorian Heritage Database. Retrieved 7 August 2018. ^ "What is the history of the Holmesglen TAFE site?". Malvern Historical Society. Retrieved 7 August 2018. ^ a b "Industrialised Pre-cast Concrete Housing". Technology in Australia 1788–1988. www.austehc.unimelb.edu.au. Retrieved 27 July 2008. ^ J. John Palen; Bruce London (1984). Gentrification, Displacement, and Neighborhood Revitalization. SUNY Press. p. 249. ISBN 0-87395-784-9. Retrieved 27 July 2008. ^ Bruce Pennay (2006). Making a City in the Country: The Albury-Wodonga National Growth Centre. UNSW Press. Retrieved 27 July 2008. ^ Grabosky, P N (1989). "Australian studies in law, crime and justice The Victorian land scandals 1973-82". Wayward governance : illegality and its control in the public sector: 197–210. Retrieved 7 August 2018. ^ "VA 508 Housing Commission of Victoria". Public Records Office Victoria. Retrieved 7 August 2018. ^ Hulse, Kath; Herbert, Tania; Down, Karyn (2004). "Kensington Estate Redevelopment Social Impact Study". Swinburne Institute for Social Research: 1. New houses for old: fifty years of public housing in Victoria 1938–1988, edited by Renate Howe, Ministry of Housing and Construction, Melbourne. 1988. Fitzroy: Melbourne’s First Suburb, cutten History Committee of the Fitzroy History Society, Melbourne University Press, Melbourne, 1991.